Getting out to the Hamptons this summer has now become even easier with the recent launch of Hampton Jitney's ticketing app for the iPhone, Portafare. 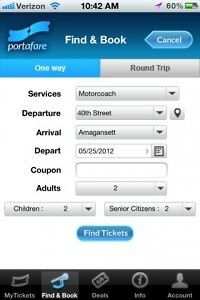 The freeapp, created by Portable Fare Systems, LLC, now allows Hampton-bound vacationers to purchase and display a valid ticket for boarding the Hampton Jitney bus. Portafare is now officially available for free download from the Apple App Store on iPhone devices, and will soon be available for the Android and Blackberry as well.